Hubert Alexander (Service No 1502) was born in Wollongong, NSW and attended Newington College and Sydney University where he obtained his mining engineers degree. 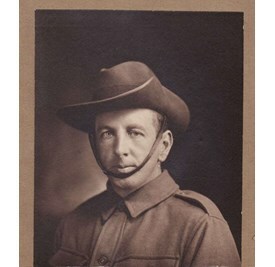 He enlisted in the Light Horse in Western Australia in 1914 but requested a discharge 3 months later. This was granted and Hubert returned to NSW to enlist there. At the time he was a single 27 year old mining engineer. He embarked on HMAT A54 Runic on 19th February 1915 with F Company, 8th Battalion and arrived on Gallipoli on 8th May 1915 where he saw service till he was evacuated to hospital in Malta on 9th July suffering from a septic arm. Hubert returned to Gallipoli on 20th November 1915 and remained until the evacuation. On 12th December 1915 he transferred to the Engineers and saw service with them. On 21st March 1916 he was sent to hospital sick. Hubert arrived in France on 9th June 1916. In September 1916 he again found himself in hospital, this time with dysentry. On 12th December 1916 he was awarded the Gold Medal Serbia for service during the MEF Campaign, no further details are given. Hubert was promoted to Sergeant on 29th May 1917. At about 11am on 28th August 1918 Hubert was engaged in reconnaissance near a train line close to the front with Sapper Stevens when he was hit by a shell and killed. A Red Cross file letter from Sapper Stevens (Service No 18649), who was wounded by the same shell, described Hubert "as the finest man I ever met". Hubert is buried in Heath Cemetery Plot IV, Row D, Grave 7. A letter was sent to his family from his Commanding Officer telling them of the respect and admiration the unit held for their son, echoing the sentiments of Sapper Stevens.